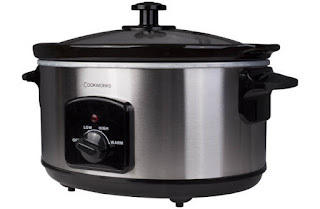 Firstly, this is the updated version of mine, this is a 5.5l Cookworks one from Argos, currently €25.99, usually €29.99, catalogue number 422/8826. Direct link here. I know nothing about any other brand of slow cookers, I do not collect them. 1. How big is your slow cooker? Mine is a 5.5 or 6 litre, I can't remember which. 2. What size of a slow cooker do I need to fit a whole chicken? My Mam has a 3.5litre one and she can fit a small chicken in it and cook in it for two people. 3. How long does it take to cook a chicken? I bang everything in on high and check it after 4 hours, medium chickens usually take about 5 hours on high, around 8 or so on low. 4. Do I put water in with a chicken? If it's just a chicken on its own, no. 5. Do you put vegetables and potatoes in with your chicken? Sometimes I put onion and carrot in underneath because it might be for a stew or casserole. Otherwise, no. If I put potatoes in I make sure they're very small cubes and I add water otherwise they will stay hard. 6. How long does it take to slow cook a ham fillet? I do not cook ham fillet in the slow cooker because the salt can't evaporate. I tried it once and it was so salty it was inedible. So I don't know. 7. Why do you cook your chicken upside down? Because the juice goes to the bottom and makes the chicken breasts jucier. 8. Can I cook a turkey in the slow cooker? It'd want to be a small turkey, but I did a turkey crown in it last year, just timed it the same as I would a chicken. 9. How long will my piece of beef take in the slow cooker? I've no idea, whack it in on high for 4 hours and check it after. I'd add a cup of water for beef because it can get quite dry. 10. How do I make soup in the slow cooker? Google "slow cooker soup recipes". 11. What else can I make in the slow cooker? 12. Have you got any go-to recipes, I need dinner ideas? 13. Can I put my slow cooker on in the morning and leave it on all day? I've no idea, I don't do that, but I presume people who actually leave the house do. My friend used to put it on low in the morning when she went to work and have her dinner when she came home. I live with someone who would plug out the fridge going to bed if he could, so nothing is ever left plugged in here when nobody's home. 14. How do I know when my chicken is cooked? If you prick it with a fork and the juice runs clear, it's almost certainly cooked. All the meat should be white. To be 100% sure, cut the thigh from the bird and check the colour of the meat - if any pink remains, leave it a while longer. 15. Do I need to cut the fat off meat if I'm on Slimming World? If you're following Slimming World 100%, then technically yes, you should be cutting the fat off. However I think you need a little fat there to help cook it - particularly with something that can dry out like a pork joint - if you're not adding tomato or some other liquid. 16. How many people will a 5.5l Slow Cooker feed? I'm not being funny but surely that depends on what you put in it - if I make a big beef stew with a pound of meat, a litre of stock and a ton of vegetables, that could yield 3/4 adult portions and a couple of child portions. If I cook a medium chicken I'll get one round of dinners and enough to make a curry the next day. If I put in two chicken breasts with some tomato and veg, then that would only feed two adults. 17. What's the best Slow Cooker to get? No idea, but I'm on my second Cookworks one now and I've no issues with it. The reason I had to buy a second was because the first one was smashed. I've never tried any other one. 18. Is it hard on electricity? No, it's incredibly easy on electricity, SEAI actually recommend the use of them to save energy [source]. 19. Are there any groups or websites for Slow Cooker Recipes? There's a really great Facebook page called "Slow Cooker Recipe Page". They have HUNDREDS of ideas, stuff I could never even dream of. 20. I have a question that you haven't answered here. An Post Address Pal - How Does it Work?